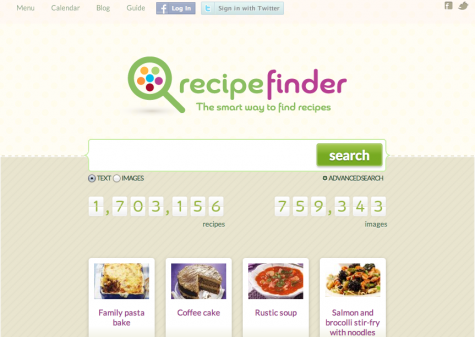 Recipe Finder, the newest recipe search engine in town officially launched last month. The recipe search engine boasts of around 1.7 million recipes and 700,000 images. The recipes in its database are indexed from hundreds of the most respected recipe web sites that one can find today. For the avid cook, the vast amount of recipes presents a lot of potential, as even with the current number, the guys at Recipe Finder continue to strive to expand their collection. Indexation of recipe web sites are done on a continuous basis, making sure that the recipes are updated and that new recipes are added to the database. The designers of the recipe search engine did an excellent job in choosing the color scheme, fonts, and other aspects of the design. The home page, as you can see above, is quite easy on the eyes. With the thumbnails of several recipes displayed immediately below the search bar, one cannot help but be enticed to explore more and get cooking! Searching for recipes on Recipe Finder is as easy as searching for whatever topic on Google, or any other search engine. The search bar is visible to even those with vision problems. The big advantage that I see is the Advanced Search option, which allows users to specify parameters such as calorie count, cook time, number of servings, and the option to include or exclude ingredients. This ability to tweak your search depending on the parameters can make or break one’s reputation during a cooking emergency, as you can easily imagine! These are times of social sharing, and it seems that most every online enterprise needs to the social aspect into consideration. Recipe Finder does not fail in this respect. It has the mandatory buttons for Facebook, Twitter, and (newcomer) Google+. What makes things even more interesting are the Facebook comments that one can make for each recipe. You can easily see how much more fun it would be to use such a recipe site together with your friends. And if you need some tools to plan your meals, Recipe Finder has you covered as well. With its menu and calendar features, you simply need to log in using your Facebook account, and you can create extensive menus and place them in your calendar. If you are in need of inspiration and information, you can also visit Recipe Finder’s blog. In the blog, you can read about holidays and what dishes are normally served during those holidays. You can also discover fun food holidays, which always give a good reason to celebrate (not that you need one!). To sum it up, there are three things one can say about this new recipe search engine. One, it offers the largest collection of recipes you can find in one place. Two, it makes searching for recipes simple. Three, it gives you the inspiration that you need to be a success in the kitchen. What more can you ask for?